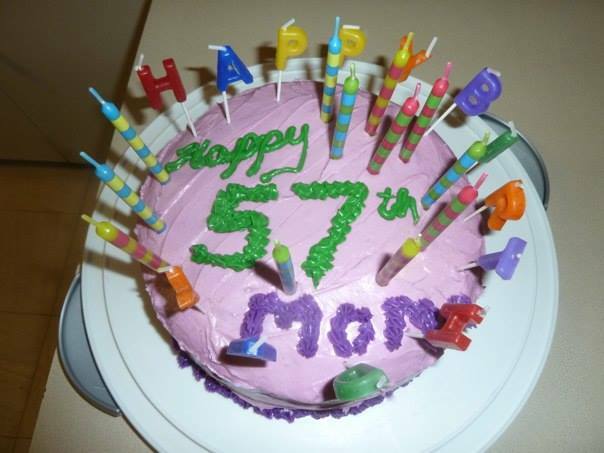 My mom’s birthday cake, using this recipe. Ignore the decorations – my pastry bag is M.I.A. so I was forced to use canned decorator’s icing! This is an adaptation of Betty Crocker’s Bonnie Butter Cake, which appears in her classic cookbook. I’ve amended the dairy ingredients as necessary. Heat oven to 350 degrees. Butter two 9-inch baking pans. Mix butter and sugar until fluffy (about 5 minutes). Mix the egg replacement and water and add, beating until combined and scraping the bowl occasionally. In a separate bowl, sift together flour, baking powder, and salt. Mix in lavender. On low speed, slowly add to butter/sugar mixture alternately with milk. Pour into pans. Bake for 35 minutes or until a toothpick inserted in center comes out clean. Cool completely. Fill cakes with lemon filling and frost with vanilla frosting. Lavender butter icing goes well with this recipe, but if you don’t like too much of a lavender taste, just use the plain vanilla frosting recipe. Blend butter and sugar until combined. Stir in vanilla and add milk until frosting is of spreading consistency. Add food coloring and mix until color is blended. *To add lavender flavoring to this icing, steep 1 tbs lavender in 1/4 cup milk until it comes to a boil. Turn off heat and allow mixture to steep for 10-20 minutes, depending on how strong a flavor you prefer. Strain and use the liquid in place of plain milk in the frosting recipe. Juice of 1 lemon, plus 1/2 tsp lemon zest. Omit vanilla and milk in the above frosting recipe and instead add lemon and zest as liquid.